T O D A Y ! is honored, to be among the featured artists. We have three copies to S H A R E! Quilting Treasures booth at Quilt Market. A Letter Stitch fat quarter! I just wish I had a place to create. I guess I create meals in the kitchen. Just wish I could create in a sewing room,too. I just moved and haven’t been able to put my space together yet but am looking forward to having my machine in front of a window that overlooks the rear deck on our house, which overlooks the woods and the river. First I must say Bravo for beeing (i’m a bee lover) in Where Woman Create! I live in an apt. I have “carved” a studio out of a corner of my dinning room, of course right near the windows for natural light. Creating, sewing, crafting and my encaustic art makes me happy. good luck to all participants. I LOVE that you mentioned your dad…….my dad is my inspiration, also. I am more like him every day, and thankful for it. My studio workspace is our walkout basement, and I have a beautiful view of our mountain property and the Roosevelt National Forest beyond. Congratulations on your acheivement! Well, I am an idea gal more than a creator. I try things, but don’t execute well. I think partly because my work space is a mess & so I don’t use it often enough. Planning to change all that, as I do need to provide an income, would rather try thru craft endeavors than go back to corporate world. PS I am so in love with your designs, especially that they honor God! Blessings! I work best down stairs surrounded by my living space. 5 years ago after the girls set off to college, I moved all of my tables and supplies into the sun room which is right next to the kitchen. I used to have my sewing machine and a few things behind the couch in the family room, but making dinner and sewing…. I had lots of boil overs, and leaping over furniture. I do not know either…. I love that my kitties still have their long bed against the big window and we are together, which they love. I can’t hardly wait to the latest issue of “Where Women Create” in which you are featured..
My Granddaughter Leanne and I have dreams of someday having a real sewing and craft studio but for now we create a lot of pretty amazing things in my living room and dining room and sometimes we even spill over into the kitchen. Our three machines are set up there humming away. We love the items we’ve made but most of all it is the cherished memories made there. My studio is shared with customers in my store who prefer the creative atmosphere of a quilt shop to their kitchen table. We have a cutting/ironing station, 8′ x 8′ design wall, kitchen, and four Janome machines set up on tables that can accommodate eight people. I tell people I’m not going to work, I’m going to my Cloverdale studio! 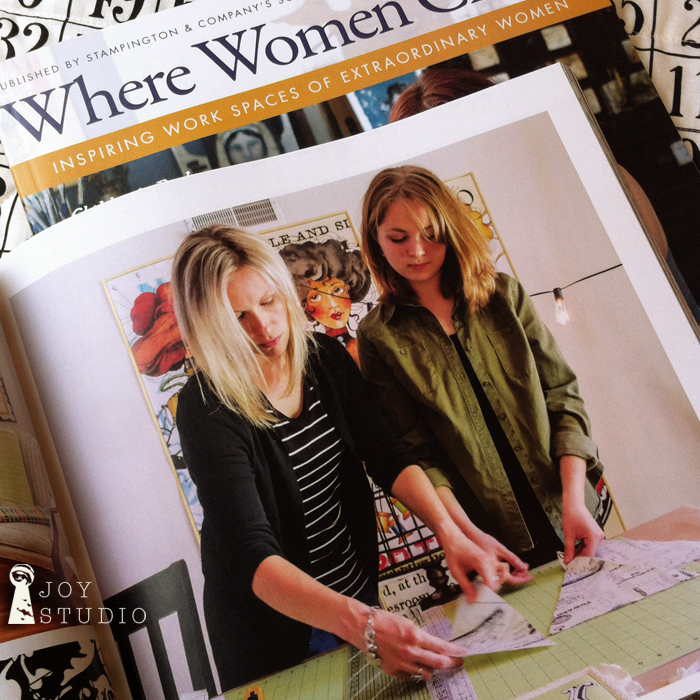 I just KNEW Joy Studio would make Where Women Create one day! A great magazine, a great design artist and great fabric. I spend a lot of time on different ideas for sewing and creating and I have a small room over our garage that works out for getting away from everything and trying different things. I try to keep it neat and organized so I can easily find the things I love to use. Lots of scraps! Oh Janet you are a wonderful artist and totally deserve this spread in a great magazine. I have purchased several issues for ideas and inspiration. I only have a tiny space to create but try to keep it fun and bright. I have a sewing table a paper crafting area and a painting table. All my crochet and knitting is done in a cozy chair in front of the tv where I spend time with Jack the cat and my best friend Art. I love your creative design with vintage wears and watercolor. I know you admire your father and the art he left you and I remember the sadness you expressed when you experienced loss also. I enjoy your expression through your photography and your blogs. Thank you for everything. Your inspiration is contagious. I love great fabric,I travel far and wide to find your fabric and I have wanted to get creating so my daughter and I went to IKEA to get a corner desk and a bright pink chair and bright pink accessories for the desk to put my sewing machine on it , I would love to create in the winter months. Good luck to all putting into the contest, God bless! I have a beautiful new studio and in the entry hangs 3 of your gorgeous prints to great visitors…just love it! I’m a lucky girl. Congrats on the article in WWC! 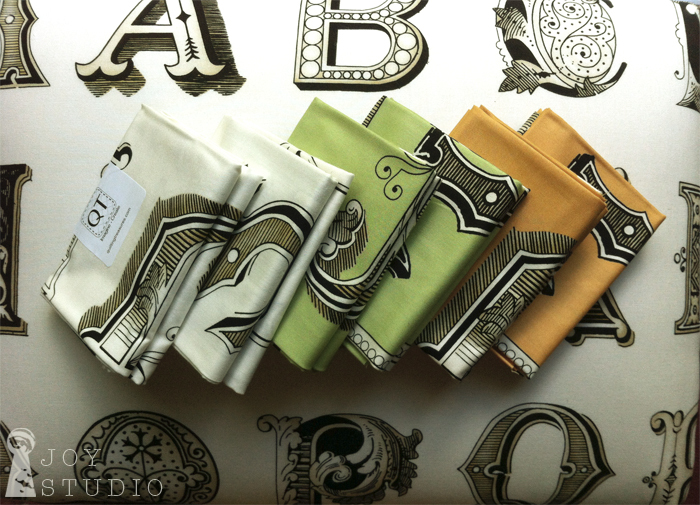 I love your style of illustration and have a number of your fabric lines! I can’t wait to see your feature in the magazine! I bet it is an awesome space to create in! I’ve filled my studio space with all things that inspire me and fill me with joy! I think this helps the brain be creative! Lots of color, pattern, and texture! Thanks for this giveaway opportunity! My favorite place to create is in my sewing room. It’s not a large room but just perfect for me. I have hardwood floors that allows me to roll between my two sewing/embroidery machines, ironing board and serger. My sweet husband built lots of shelves and provided great lighting. I taught school for 38 years and now for 14 years I have a haven for creating and quilting. And I loveeeee your fabric. Thanking God for the inspiration he has given you (and me). My studio is in the basement. When I had water damage a few years ago, I got busy with the paint and everything is white except for the built in desk that has a bright blue top. Now, if I would get down there and straighten it up, it would be more enticing to work in. Soon, soon……….. I am so blessed to have a great craft room! It is so wonderful to finally have a space to call my own! I just finished redoing over my creative place. I love it. I love my creating space in my home, my sewing room 🙂 My husband over the last few years has helped me make it much better with a mobile cutting/storage cabinet, new lighting and my new Bernina sewing/embroidery machine. Feeling very blessed on a beautiful GOD loving Sunday!! Thank you for inspiring me with ALL of your awesome fabric lines. Janet love and enjoy that you incorporate Gods word, keep up the awesome inspirations. and is my retreat from the stresses of life. It is my favorite place to be. The only problem is that I also love to collect fabric and have run out of space! But I will always find a nook or cranny for your fabric. I just love your designs! . Your designs talk to my heart! I so enjoy them. I create in my kitchen…not only food but quilts as well! My husband and I built our retirement home. 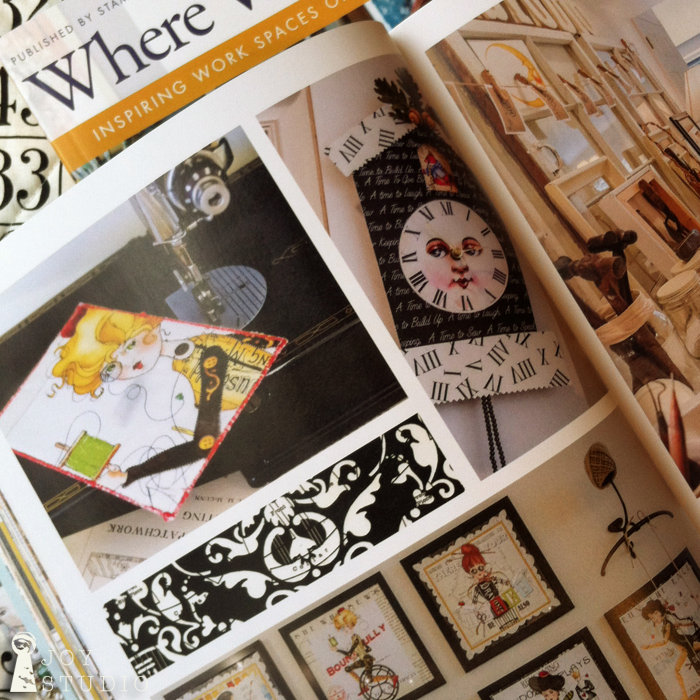 Included in it is my beautiful seeing/quilting/designing space that I love to create in! 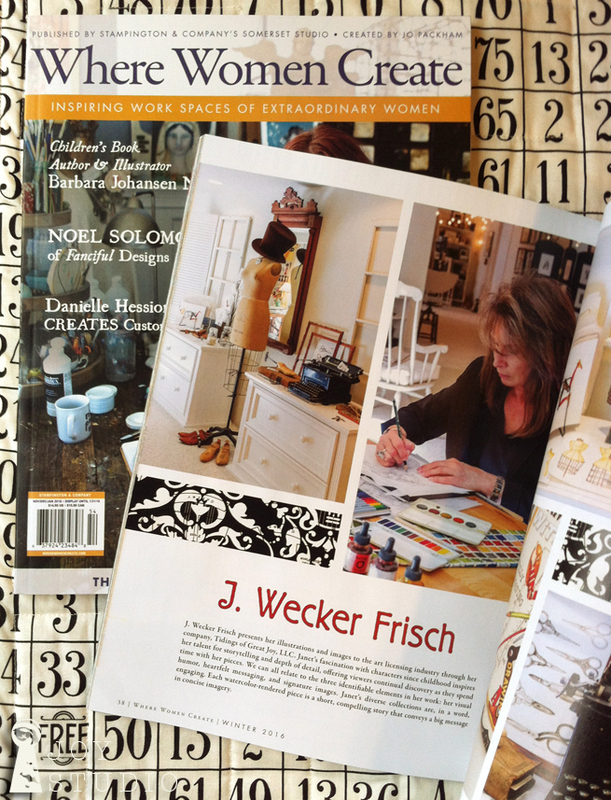 Lovely post, congratulations on the WWC article, it is a wonderful thing to have such a lovely space in which to create! I usually create in my sewing area of our basement, however for the summer and as I finish up a very large quilt, I am using our dining room. This is almost done so it will be back in the basement for the winter. Thanks for the chance to win! I’m very lucky to have a dedicated sewing room. It’s one of my favorite places to be! Yes, Rhonda . . . it is yours! Yours and Terry M’s post card photos are both included in the WWC feature. I admire the many skillfully sewn post cards from the challenge exchange so I have them displayed throughout the studio. I’m carving out some space in a spare bedroom. Only problem is that I need more lap space for my dog! or viewing movies on a big screen. I love my new space. For right now I create in half of our family room but soon I will have a huge room to create in, as we built a new garage and I get the old attached garage to create in. Yahoo!!! now that I’m an empty nester, I actually have two places to work; my favorite, however, is the front room of my apartment – there is a large bay window in the front and another window on the side – I can see into the living room and watch/listen to TV as I sew. My son bought me a huge IKEA work table a few years ago and I adore it – I can spend hours in that room! Looking forward to seeing the article about your work area in Where Women Create. I created a space to create!! With the helpful hands of my daughter and neighbors, we reconstructed a two car garage into a sewing/ weaving studio! I love my ever evolving space! I hope to have others host their creative ventures there to one day! My creative nook is tiny but I love it. I decorated it myself mostly with vintage items and upcycled items. I love knowing that it’s very unique because that’s my style. I am a sewist, quilter, and a calligrapher. I have many sewing machines, cutting tables and a drawing table. Along with all of the supplies that accompany these arts, my workspace is looking and feeling more and more like a storage room. So I’m starting to take over our semi-finished basement as my workspace. There’s no beautiful view, but I expect that having fewer distractions will help keep me focused on my art. Fingers crossed! My husband and I recently had a house built in PA. The finished basement is my new studio! I hired a carpenter friend to build me cabinets, shelves and two huge sewing tables. It’s wonderful. I went from a tiny 10×10 attic room with no heat/air and terrible lighting to a 1200 square foot room with lots of natural light. I am so blessed. I look forward, every day, to spending time working on my art quilts. My space is an intimate space. Ok, some would call it small and cluttered, but it’s my happy place where my creativity runs wild! I have a wonderful space created in our up stair room, my husband took down walls, raised the ceiling and now I have a cutting table and store bought counters to work on. I absolutely love Hand Maids and all of the attached entities. Love the fabric designs and all of the ‘very different and lovely” creations. My “space” is one room for my sewing machine and fabric stash shared with my office in one corner. After not using my guest bedroom for several years, got rid of all the “bedroom stuff”. Put steel shelving along one wall and was able to get all of my ‘fabrics that were stored in tubs in the shed’, on those shelves. Built myself an ‘ironing table’ which is great, put up a cutting table and am now ready to roll. Now…if I could only find the time to use all of this, I would be very happy. I have a great sewing studio in what was formerly a 2 car garage. Except for a corner where my husband has his workout equipment, I have shelving for storage. I also have two tables for sewing, one for serging, and room for a 10′ quilting frame and machine. I’m in heaven. Now all I need it time. My sewing area was once the laundry room, but it has large windows and a lovely view of an active volcano out of the window! I am joyously and wonderfully blessed with a husband who knew when he married me creative space was a NEED. He converted the tuck under garage to my art studio and since I also do glass fusing, is insulating our small barn to studio space as well…mine is not as pretty as yours but just as blessed. I am just starting to get items created for resale…wish me blessings as I would love to be featured like you …love your fabric and embroidery patterns! My sewing space shares a room with my desk and computer. I sometimes spill out of that room and take over the quest room. Right now, I have several projects going so I’m using the dining room table downstairs to lay out a quilt. I have been very blessed to have the desire and abilitity to sew. I recently retired from teaching sewing at our local a High School. So all those years I basically sewed in my department. After retirement, I knew it was time to update my 1982 Singer sewing machine. So after choosing a new Baby Lock Sewing machine my family decided it was also time to create for me a new sewing lab in our home. Once it was designed I found your beautiful She Who Sews fabric line which fit perfectly in the look that I wanted to use in curtains, machine cover, Bench seat cover etc. I have a wonderful workstation, pressing station, and also a new sewing cabinet to house my sewing machine in. My favorite place to create is at quilt retreats! Yes, I have a room, studio if you will, and although it is cramped, I get a lot done there. However, it’s just me, the washer, dryer and TV along with all my collection of quilting/sewing patterns, books, magazines, thread, fabric, and machines. But, it is the retreat where camaraderie happens, ideas flow, and fun is had! I have a sewing room upstairs in the former bedroom of one of my daughters. It is bright and sunny on most days, and on a winter day, it is the warmest room in the house. I love it! I have a wonderful creative room. We recently moved to a bigger house and I now have the old living & dinning rooms as my sewing space. With 6 Ikea big shelf cubbies for all my fabric. And a wall of windows! It is fantasmagorical! How exciting to be in Where Wonen Create! I’m a quilter and have loved your fabric lines and art! I knew you, Janet when I lived in High Ridge in the late 70’s and early 80’s. I love create but not great at any one thing! Might look up your store sometime! My favorite place to create is at my sewing machine in front of window facing our winter king hawthorn tree in our front yard. I love watching the birds in the tree. It is so relaxing. I love to move my sewing machine into my sunny family room, and create while my husband and I share some time together. I also live in an apt. My cute white antique table, a kitchen counter, patio to paint things, or my ironing board are in service for creative endeavors! Congrats on being in the magazine. I live alone so my creative work space is wherever I happen to be at the moment. I have carved out a space for my sewing machines in what was previously a laundry room and spend a lot of time there. I have a gorgeous view of an active volcano, coffee fields, and a huge mango tree. Mi enhorabuena, me encanta tu trabajo. Mi lugar para crear es un pequeño cuarto que espero poder mejorar pronto, aunque me siento muy a gusto en él, es soleado y está repleto de material, jiji. Un abrazo! I created a sewing studio with She Who Sews and Draw Near as my inspiration and décor. Your collections inspire me everyday (I have a stash) – I had just taken up quilting as a hobby when I found the Handmaids. I am a fan. My creative space is a mess – I need more storage and a smart way to organize! But amazingly, I know where everything is! My sewing studio may be small, but it’s a mighty space. It’s where my creative juices flow and fabric turns into treasures! I love your fresh approach to quilting and fabric. I find my best work is done on my kitchen couter and dining room table. They are my largest spaces and my dog doesn’t mind the creative chaos. I’ve been very lucky, I have had my own space for a long time. It is not always neat, but, I know where everything is! If I had a larger room, it could be so much more…I have a little 9 x 9′ loft space..taken over the closet in another room as well. haha but, I love having my own place to work! I have a cute little space in my house that I love to create in. 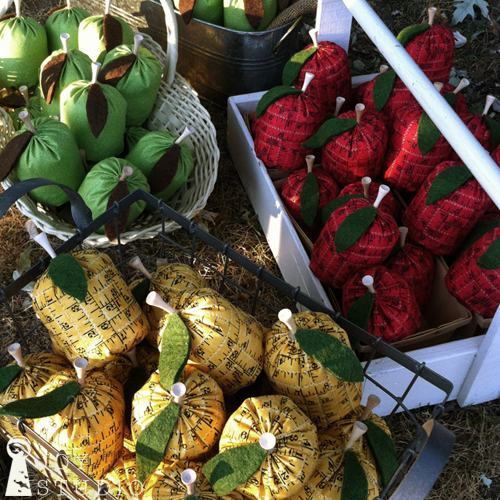 I have used your fabrics to decorate it, and I love to get new ideas from your blog. Your fabrics are beautiful and I look forward to making beautiful things with your new fabrics! Love to see your ideas. I just cleared out a small bedroom and made myself a fun seeing room. Where Women Create is great. Enjoyed your article. My creative space was a 4th bedroom but now is my sewing room. I spend hours arranging my fabric, patterns and stuff besides sewing. I love admiring the work my husband has put into my my creative space. When my son moved out last October I immediately took over his old room. I have enjoyed finally having my own space to create. I know I could probably do better with the space, but it’s fun to know I can just close the door on whatever project I’m working on. Just found you all, so excited to follow along! My favorite creative space is in my store. I own Midtown Eclectic Mall in Springdale Arkansas and it is a funky decorated, explosive, fresh, creative space! We have a vintage water fountain hanging from the ceiling near a French Country cottage that looks lost in the woods with vines and such on top and tree standing nearby for starters…inspiring is a great word for my place! We hear that we inspire creativity in many of our customers as well. We paint with Plaster Paint, upcyling the ugly! We craft galore! Many times I am infused with a new idea just by walking the aisles! I would love a copy of your magazine! Whether I win or not, I will have a copy soon! Best wishes and thanks! Just found your wonderful art and fabric, love it! I am blessed with a large space, with many windows looking out over the woods. Can’t wait to re-do with your fabrics!